Discussion in 'Personal Paint Logs' started by Lord-Marcus, Oct 14, 2016. As said, here is a log where I will specifically post about the non-lizardmen related projects i am working on. to kick her off, here are some various images of two current projects, empires of dust and varangur in no particular order. there is also a smattering of regular undead in there. Lord Agragax of Lunaxoatl, Warden, BeardyGecko and 2 others like this. From the armour on the last picture. Just really stands out to me. Did somebody order magus conclave for Varangur? Reaper bones are great! Almost have something for any occasion! Warden, tom ndege, Jorgik and 1 other person like this. The heraldry painting project begins! Warden, Bowser, Jorgik and 1 other person like this. Just busy making products and getting ready for the wedding. Am I insane to try and paint this stuff on /72. Yep. Warden, n810, tom ndege and 1 other person like this. Which did you choose, btw? I believe they're both Noble houses and Royal House. Bowser and tom ndege like this. Nice book finds! I have a couple heraldry books myself at home! Very useful for work with bretonnians. I started the new year off correctly. 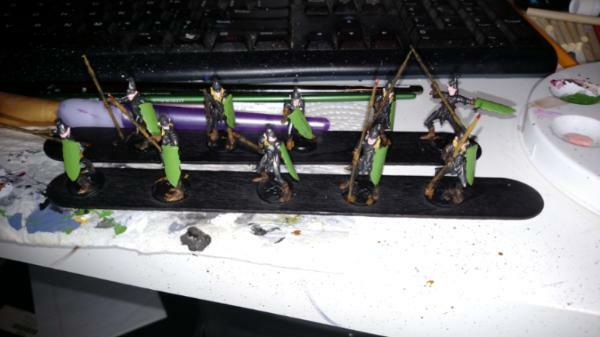 Got 5 elven spearmen from primer to painted. Warden, tom ndege and Bowser like this. Warden, NIGHTBRINGER and Bowser like this.